WorkForce ET-4750 EcoTank All-in-One Supertank Printer The remote EcoTank across the board with Cartridge-Free Printing, touchscreen, and ADF/Fax. The WorkForce ET-4750 EcoTank across the board, controlled by PrecisionCore, offers progressive sans cartridge printing with simple to-fill, supersized ink tanks. It incorporates up to 2 years of ink in the box1. That is a fantastic measure of ink – enough to print up to 11,200 pages2, and equal to around 30 ink cartridge sets3. Furthermore, it highlights auto-stop ink bottles with each shading exceptionally keyed for simple filling of each tank. What's more, you set aside to 80 percent on ink with ease substitution bottles4. 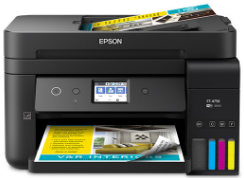 The ET-4750 likewise offers a high-limit 250-sheet paper plate, fax, 2.4" shading touchscreen, 30-sheet ADF, quick auto 2-sided printing, and helpful wired and remote systems administration.